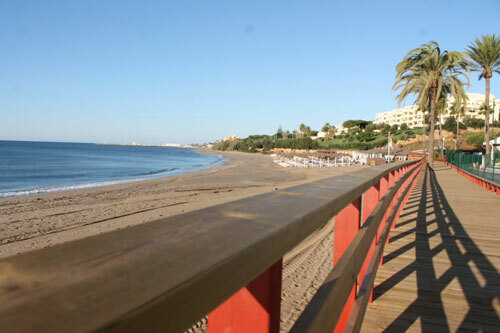 A Fantastic NEW wooden path that runs along the coast it connects Calahonda to La cala de Mijas. 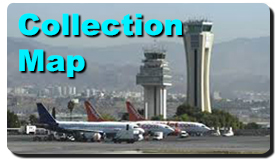 Its a perfect way to take a stroll and stop in the many bars along the route. Tots Store Hires Scooters and bikes which are perfect for this walkway. So contact us to hire your equipment so that the children will enjoy this perfect walkway too. 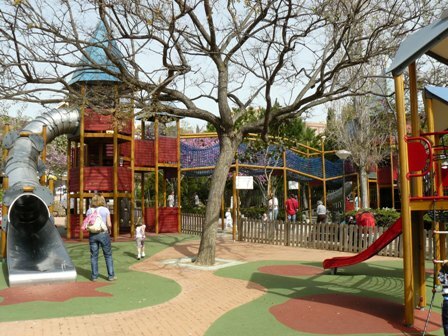 Parque de la Paloma, or Paloma park, is situated right in the centre of Benalmádena, in Arroyo de la Miel. Covering some 200,000 squaremetres and only 200m from the main coastal road of Benalmádena Costa, or 10 minutes by car from Benalmádena’s old town. The park has birds, ducks, geese, pigeons, chickens, roosters, and peacocks, all of which are roaming freely around the park you can buy feed at the entrance and feed then animals and birds whilst you have a stroll around.. There is also a large pen with an Emu’s, and a compound with Mountain Goats. There are even rabbits hiding around the bushes. There are various main and side entrances to the park, and 3 little cafe’s – each of them nearby an entrance, there are also bikes to hire for all the family and plenty of park space to have a picnic or kick a ball around. The village of Juzcar has been given new lease of life thanks to the Smurfs from Sony Pictures and a lick of blue pain. There is a little town in inner Andalusia called Juzcar. In the middle of the wild and beautiful Serranía de Ronda, the mountains that surround this typical Spanish beach village, Juzcar had major unemployment. “This is the most hidden village of the Serranía”, says a bus driver who travels from Ronda to the area several times a day. 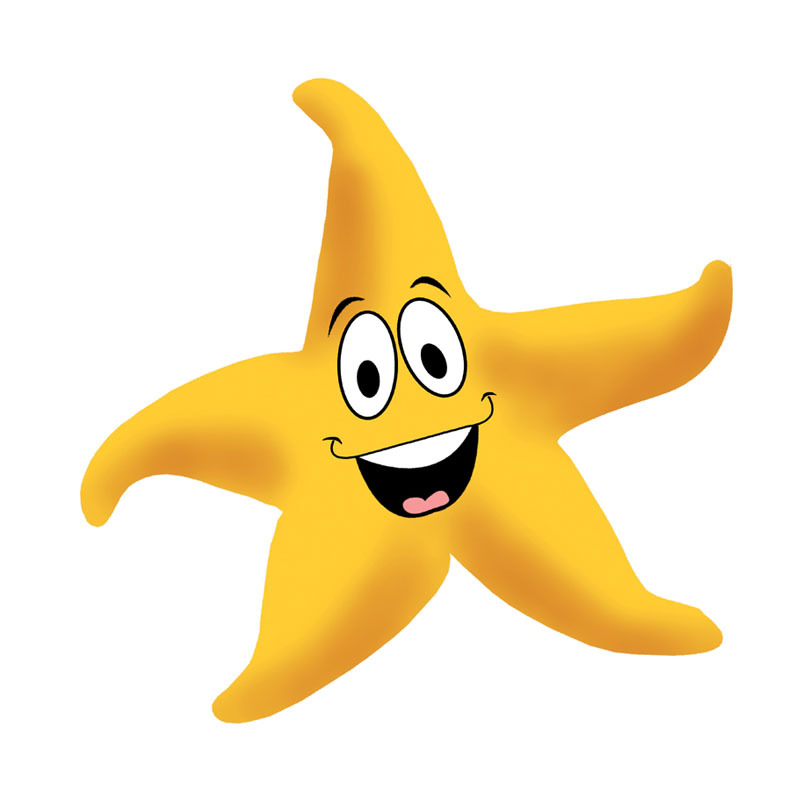 “Tourists just visited more accessible places and never arrived here”. The local bar, says the bus driver, was a very small business only for locals. Today it is full of people due in no small part to that fact that all the houses but one of this village of 400 people are painted in blue. Self-baptised as “the world’s first Smurf town” it could be seen as a corporate fairy tale. Back in 2011, Sony proposed transforming Júzcar into a Smurf town for a couple of months to promote of the release of Raja Gosnell’s film based around the pint-sized blue characters. All the houses were painted blue by the company and major big promotional event was held in the village to promote the film’s opening in Spain, where the Smurfs are highly popular. 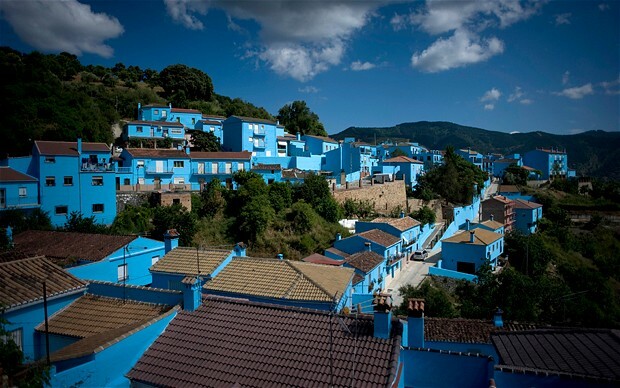 Sony had promised to repaint the houses to their original colour – but, that summer, visitors to Júzcar were up 200,000 on the previous year and local economy boomed. Two years later, Júzcar is preparing for another boost as the sequel to the Smurfs opens in Spain on August 2 and Sony are back on town, along with international superstar football player Andrés Iniesta and Spanish model Eva González. The sight of Iniesta being cheered by the whole village in the main square (with a church painted, of course, in blue and a big Smurfette statue at the door) is quite impressive. When he finishes his brief speech – basically a salutation for the locals – he has to abandon the place surrounded by no fewer than 15 police officers to protect him from public hysteria. The CEO of Sony Spain, Iván Losada, also spoke about the commitment of Sony with Juzcar and their people while the major said he was proud of being the first Smurf town in the world, recalling the improvements the village has experienced since then. There is only one person in Juzcar who is not happy with the “Smurfness” of the town and refused to have his house painted – and is therefore known locally as Gargamel [the villain in the Smurfs]. Full of souvenir stores and busy parents with children (their faces painted blue), Juzcar has been revitalised. That night, national news dedicated a slot for the Iniesta event. However, for Juzcar and Sony’s marketing department, the “Smurfing” of the village has changed lives and brought the area back to life. If you wonder why Sony chose this sleepy village nestled in the hills of Andalusia for their world premiere, you should know that Juzcar has a long mycology tradition and the smurfs are especially known for their craving for mushrooms. Each autumn, the picturesque area surrounding the village is brimming with all kinds of delicious fungi, making for a paradise for mycologists and nature lovers. Moreover, the Smurfs village is also an excellent destination for culture, food and outdoor enthusiasts with a good variety of hiking trails, culinary tours and cultural excursions.